WordPress login page comes with a default WordPress logo that points to “wordpress.org” and the alt text says “Powered by WordPress”. While I am grateful to WordPress, I would like my visitors/registered users to be able to identify my blog easily. The fact that you are reading this shows that you are interested in this as well. So in this post I explain how to easily change WordPress login logo, pointing url, and alt text easily with and without a plugin. If you are looking the “without plugin” method, you can skip to the next page. The default WordPress login logo is, at least to me, unappealing, contains an alt text that is irrelevant to my blog, and points to a URL other than my blog. A simple, lightweight WordPress plugin to change your login logo. One step process: just upload the logo and you are done. This plugin requires just a little bit more work than the first one. Just drop the logo file named “login-logo.png” into your WordPress content directory, and this plugin takes over. CSS is automatic. 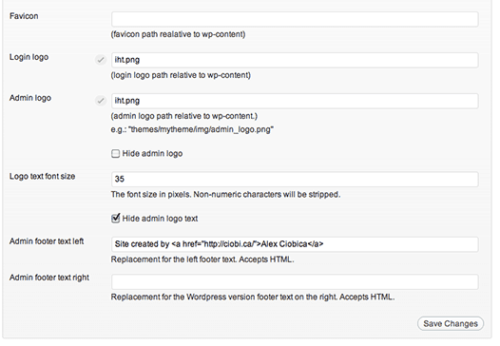 With this plugin you can display your own logo on the WordPress login page. You can also specify the link attached to the logo. By default you are redirected to the homepage of your site. This plugin, by far, offers the most customization options. You can change, favicon, logo, logo text, logo text font, and so many other things. If you are looking more than just a simple logo change, this is the one to go for. Now that I have pointed out some of the plugins available to change WordPress logo, let me explain how to do this without the plugin. Although, in this case it may not apply, I always like to backup any default file before I mess with it. So let us first backup some files before we start. Rename this file to logo-login-default.png. Now upload your logo (in .png format) to the same location. And that is it for changing the WordPress login logo. Save the file and exit. Your WordPress login logo, alt text, and URL should now be changed (you may have to clear browser cache and refresh the page). Simple right? You may want to implement a caching system to improve the loading time of your logo.